Nearly 24 thousand islands make up the Stockholm archipelago and no journey to Sweden would be complete without a seafaring adventure to them. Many islands are deserted and Swedish law dictates a right to spend one night wherever a Baltic Sea journeying vessel, be it a water taxi, sailboat, or kayak lands--even on private property. 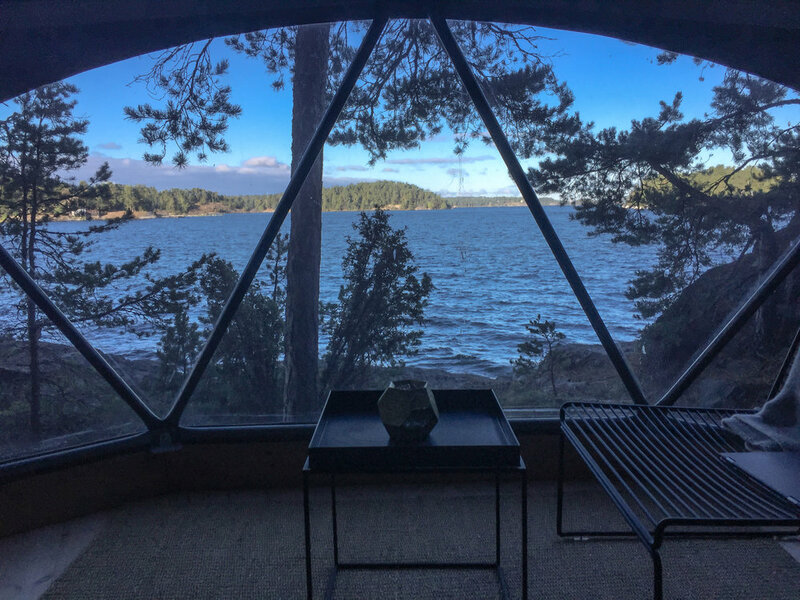 For those souls committed to planning ahead, a reservation at ISLAND LODGE may just be the perfect first stop of a Scandinavian adventure. Jet lagged stateside travelers will recover quickly on this tiny island as hosts Kristina and Torkild forever change the way one thinks about "camping". Spacious geo designed tents with wood fired stoves, goose down comforters, sounds of lapping water, and unfiltered nature views combine for the ultimate archipelago experience. For those souls committed to planning ahead, a reservation at ISLAND LODGE may just be the perfect first stop of a Scandinavian adventure. Jet lagged stateside travelers will recover quickly on this tiny island as hosts Kristina and Torkild forever change the way one thinks about "camping". Spacious geo designed tents with wood fired stoves, goose down comforters, sounds of lapping water, and unfiltered nature views combine for the ultimate archipelago experience. An introduction to Scandinavian cooking includes salmon belly cooked on a wood fired OFYR, a Netherlands designed grill, caviar and champagne, and a sliver of the traditional mint green prinsesstårta (spongy layers of cake alternating with jam, vanilla custard, and whipped cream topped with a thin layer of bright green marzipan). Follow up with an afternoon of jumping into the chilly waters of the Baltic Sea and warming up aboard a floating-at-sea wood-fired luxurious sauna in which the island hosts deliver a glass of wine to guests. Invite any other island guests for a semi-competitive Viking game of Kubb in which two teams take turns tossing batons in an attempt to knock over farmers and capture the opponent's king (try to avoid nicked shins with wild tosses). Watching the sun set and stargazing from a hot tub built into the shore helps weary travelers adapt to the long days of Swedish summer. Sea kayaking to view the nests of sea eagles and isolated protected populations of gregarious grey seals diving for herring is an archipelago must excursion. Listen carefully to the guides detailed descriptions of the islands and their inhabitants. From Swedish summer cottages to World War I and II military installations, the shore is dotted with history--even the traditional red stain ubiquitous to the homes along the archipelago preserves a bit of Swedish heritage. Falu, a red dye abundant in the run off chemicals from the copper mines of Sweden, is cooked and mixed with linseed oil and rye flour to make a paint that is inexpensive, low maintenance, and a cherished reminder of the importance of the mining industry in Sweden. Cooking outdoors on the beach of the ISLAND LODGE introduced the art of social cooking on the OFYR. Slices of freshly caught Norwegian salmon take less than 30 seconds on the grill's surface to cook and every guest is invited to cook their own supper. The large gathering fire pit style grill may be transported from the backyard, to the beach, or to a mountain chalet.